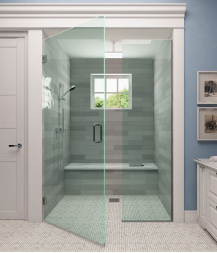 Invisiwall® Shower Enclosures offer a complete package, pairing custom glass fabrication with myriad hardware combinations. 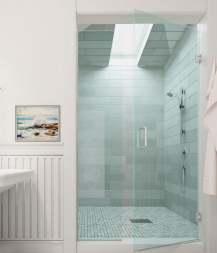 Our team of experts will work with you to provide technical assistance and specification support, ensuring quick-turnaround for your shower door projects—large and small. We specialize in high-volume or bulk projects by offering a variety of products and style that large commercial applications demand. Smaller commercial jobs also are welcome, as our options offer maximum quality and performance. Every shower enclosure can offer its own unique look and feel. With multiple glass, hardware, and finish options, we have the selection to meet almost any design scheme. 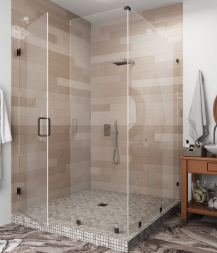 With the abundance of shower door hardware and glass options available on the market, selection can be intimidating. 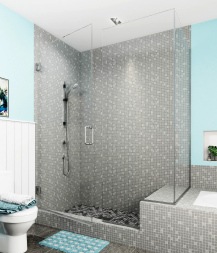 However, Invisiwall Shower Enclosure experts can help simplify your selection process. Browse through our product offerings or contact us directly at sales@invisiwall-info.com for more information. Using 2 Hinges 110 lbs 36"
Using 3 Hinges 140 lbs 36"
Using 2 Hinges 100 lbs 32" 100 34"
Using 3 Hinges 130 lbs 32" 130 34"
Using 2 Hinges 80 lbs 28"
Using 3 Hinges 120 lbs 32"